This poem takes on an imaginary life of its own. Abandoned by a coward of a father, my life went downhill from there. Sixteen-year-old Andrew is in love with a girl named Susie. Purchase Raffle Tickets for a chance to win some AWESOME prizes and support a GREAT cause! THIS RAFFLE IS CLOSED UNTIL NOVEMBER 2019! WINNERS HAVE BEEN POSTED BELOW! Prize Details: Winner receives 1 Million Gift Points to use as he or she wishes! Prize Details: Winner receives 500,000 Gift Points to use as he or she wishes! Prize Details: Winner receives 250,000 Gift Points to use as he or she wishes! Prize Details: Winner receives 100,000 Gift Points to use as he or she wishes! 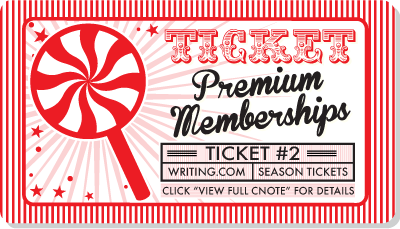 Prize Details: Winner receives one-year Premium membership. Prize Details: Winner receives six months Premium membership. Prize Details: Winner receives three months Premium membership. Prize Details: Winner receives one-year Upgraded membership. Prize Details: Winner receives six months Upgraded membership. Prize Details: Winner receives one-year Basic membership. Prize Details: Winner receives three months Upgraded membership. 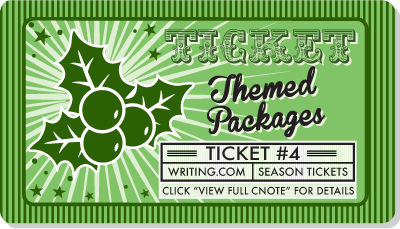 Prize Details: Winner receives a package full of things writers need, want, and wish for! I'll ship a box anywhere in the world, packed full of hand-selected, high quality gifts, goodies, and whimsical items, including a hand crafted book mark, made by the winklett herself. Worth at least $50. Bonus of 50,000 Gift Points included! Prize Details: Winner receives 250,000 Gift Points, plus a Sr. Mod Special Appreciation Merit Badge, including the physical badge mailed to them! Prize Details: Winner receives a chocolate-themed prize of a 100,000 Gift Points Gift Card to "Rach's Chocolate Emporium" ! Prize Details: You'll win six custom signature images, such as seasonal or hobby-related, from "Leger's Shop" ... plus the lucky winner receives six months Upgraded Membership! Prize Details: Winner receives 500,000 Gift Points to be used for a commissioned custom merit badge of their choice! Winner will fill out "Commission a Merit Badge" and give the StoryMistress their details for a personal or group badge. After design and implementation of the badge, winner will be awarded the virtual and physical version of the badge! Donated By: "The WDC Angel Army"
Prize Details: Winner receives two handmade signatures each for winner and friend! (Must redeem within 6 months.) If images require drawing, winner will receive the original draft drawings as well. Physical address may be needed! Prize Details: Winner receives a portfolio review and 25K Awardicon for one item! Plus winner will be awarded all three of donor's commissioned MBs: Hope, Believe, and Dream, all given at 2 week intervals to assure CR. 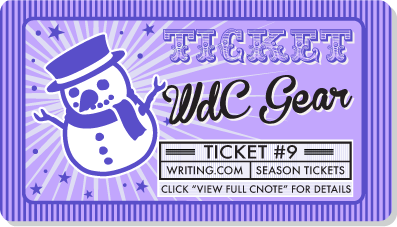 Prize Details: Winner receives in-depth reviews of 5 short stories OR 1 novel, plus an appropriate Merit Badge, an Awardicon (at least 25K) for donor's favorite item, and a mystery number of Gift Points (100K max)! Prize Details: Winner receives a portfolio raid and one for a friend! 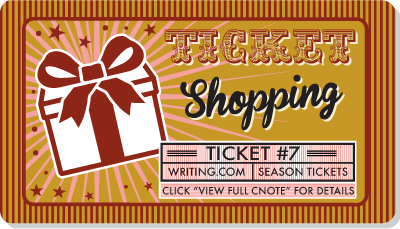 Prize Details: Winner receives $25 in Gift Points to shop in the Writing.Com store! 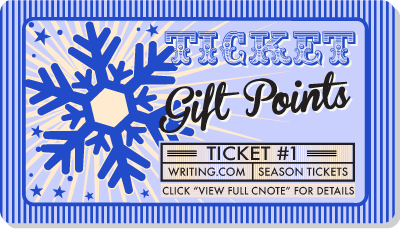 Prize Details: Winner receives $10 in Gift Points to shop in the Writing.Com store! 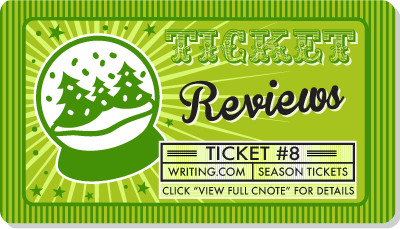 Prize Details: Winner receives five short story reviews (2,000 words or less), two short story reviews (4,000 words or less), plus a 10,000 gift point awardicon for my favorite story in each category, plus a merit badge of donor's choosing! Prize Details: Winner receives 1 Marzipan Fancy from Rach’s Chocolate Emporium, 2 reviews, 1 Verdant merit badge, 1 Second Time Around MB, and 1 25K Awardicon. Prize Details: The "Flight of Fantasy Review Package" Review Package has four review options to choose from. There is a mix of short stories, novel chapters or poetry review options together with Merit Badges, Awardicons, Gift Points or a 10K Gift Certificate for either "Flight of Fantasy Signature Shop" or "Flight of Fantasy Custom Signature Shop" . Prize Details:Winner receives Baker’s Dozen Merit Badge Pack: 13 Merit Badges (1 per month for 13 months) and a Baker’s Dozen Review Pack (13 Reviews; 1 review per month for 13 months). WINNER: Chris Breva - 6 Years at WDC! Prize Details: Winner receives a handmade 12" winter-themed wreath, shipped to US only via USPS (Gift Points if international winner - $30 value). Prize Details: Winner receives a handmade 6" winter-themed wreath, shipped to US only via USPS (Gift Points if international winner - $15 value). Prize Details: Winner receives a handmade 6" spring-themed wreath, shipped to US only via USPS (Gift Points if international winner - $15 value). Prize Details: Winner receives a handmade quill pendant made from the combination of an original watercolor painting and digital art printed and sealed under glass then mounted in a sterling silver setting. 18" Sterling Silver Chain included. Est. Retail value is approximately $50.00 Pendant is 30x22 mm Oval. Ships worldwide. This is a digital mock-up of what it will look like "Pendant Art" . Prize Details:Winner receives a handmade Christmas ornament. It's made using a real chicken egg, comes in a Christmas gift box, and will ship worldwide (an overseas winner may not receive it before Christmas). Prize Details: Winner receives a set of five related poems about a topic (or related topics) or person of the winner's choosing. The poems will include at least a Sonnet, a Clerihew and a Rondel, but the winner is free to pick another format or two. Makes an excellent gift for a special someone! Choose the Raffle Ticket (cNote) below that you would like to purchase. The Ticket should be sent to the person for whom you are purchasing the ticket. 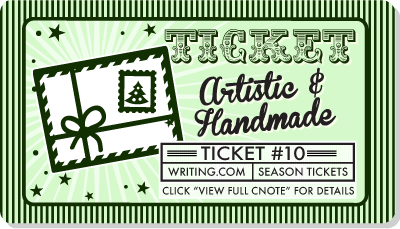 If the ticket is for you, your username must be in the Recipient textbox. If you are purchasing the ticket for a friend, place that member's username in the Recipient textbox instead. EASY! 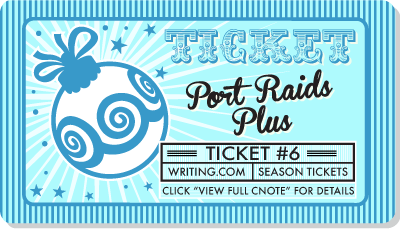 Purchase up to FIVE (5) TICKETS (of the same kind) at a time! If you would like to purchase more than one ticket at a time, simply put the usernames in the recipient field separated by commas. 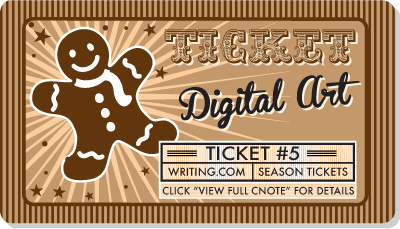 Each username entered into the recipient field is equal to one ticket purchased and the cost of each ticket will be deducted from your Gift Point balance for each name. Raffle tickets may be purchased for your friends anonymously. Just choose the "Send This cNote Anonymously" option before purchasing your raffle ticket(s). Each ticket varies in cost. You may enter as often as you wish! 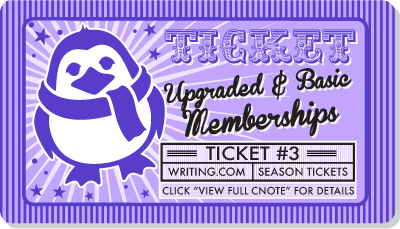 All GP's raised will go to "RAOK Upgrade Brigade Group" and will help support your favorite online writing community! Gift Points are automatically deducted from your account as soon as you purchase the Raffle Ticket(s). This contest will run from November 28, 2018 through January 1, 2019. Winners will be randomly drawn from the pool on January 2, 2019. A sitewide announcement of the winners will soon follow. If you are the winner of a prize, the specific details of your transaction shall be handled between you and the person whose donation you won. Gift Point and random donations are most certainly welcomed and will go to benefit "RAOK Upgrade Brigade Group" ! All donations of 50,000 GPs and over will be recognized here, with a link to their portfolio. All donations of any amount help and are appreciated, though, and will be listed along with the collection's total amount! Plus 90,000 GPs from smaller donations! Would you like to make a donation to the contest to support our cause? If so, please send your Gift Point donation in an email to The StoryMistress along with an explanation and you will be included in our Thank You area! All donations are appreciated! That is 9,660,750 Gift Points raised and to be donated to "RAOK Upgrade Brigade Group" ! A huge thank you goes out to our donators for their generous prizes! The community of Writing.Com appreciates your gift, time and participation in the contest. SM and I appreciate everyone's efforts and we look forward to making this contest a huge success! 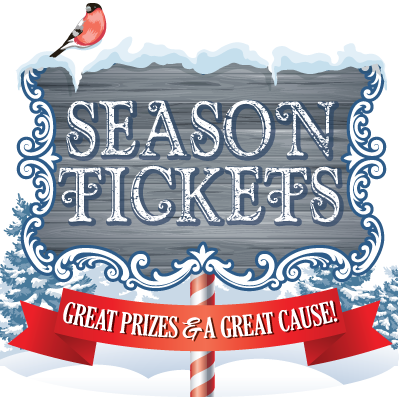 Have a FUN time with the Season Tickets Raffle! The members of Writing.Com thank you for your generosity! Need Gift Points to purchase your tickets? Choose one of the available cNotes from the selection below and check the circle next to "Choose this cNote". Each cNote may differ in subject, price and inner message. Click the "View Full cNote" link to view its sample. Send to multiple recipients by separating usernames with commas (up to a maximum of 5 recipients). You must include a message of 3 characters or more to be sent with this cNote. WritingML will work within cNotes. Generated in 2.61 seconds at 2:32am on Apr 20, 2019 via server S30.